Maysa | Love Is A Battlefield - TheUrbanMusicScene.com | Music Reviews! Since her instantly recognizable voice graced the British Soul/Jazz outfit Incognito and Stevie Wonder’s Wonderlove, Maysa Leak continues to energize her own career by recording idyllic vocal treats for faithful international audiences. While she still keeps her feet wet with Incognito, the U.S. born singer remains very active in the recording studio, especially handling many cover tunes in her warm jazz-tinged alto, one of the many reasons she remains a bright spot for the smooth jazz market. Yet even for the most assured vocalists to confidently reinterpret the classics on a regular basis, song choice becomes a critical manner. One of the qualifiers for Maysa when picking material is looking for a positive aspect in the lyrics. Looking at her later catalog that includes Back to Love and Sweet Classic Soul, Maysa backs up her vocal dexterity and tone with re-imaginings of seventies soul standards. For her latest release, Love Is A Battlefield, covers representing soul, rock and pop are the order of the day under producer/musician Chris ‘Big Dog’ Davis, The Heavyweights and Jason Miles, and usually the results are favorable amongst a heavy dosage of slow jams. Maysa’ special strengths are assured within the ballad zone, starting with “Can We Talk?”, a Tevin Campbell hit written by Babyface. Though this version does not deviate from the original, the beats are definitely pumped up. The Isley Brothers’ steamy “Footsteps in the Dark” drops a rousing duet with Jamie Jones of All 4 One, which overshadows the fairly thin production values. “Mr. Dream Merchant,” recorded successfully by Jerry Butler and New Birth, receives a very faithful makeover by Maysa, capped with a refreshing, crisp organic orchestration. Yet with all these gems, the title tracks delivers the ultimate highlight, flipping the bouncy new wave element from Pat Benatar’s eighties’ smash into a mesmerizing acoustic, finger snapping backdrop where Maysa’s gentle touch reigns. Unfortunately, the gift of song choice on Love Is A Battlefield does flounder with “As Long As You Love Me.” Perhaps Maysa could have integrated her unique vocal qualities with a complimentary arrangement for Justin Bieber’s recent dance/pop hit, much like the title track. As for “Because It’s Really Love” from one of soul’s best stylists ever, Luther Vandross, Maysa provides a steady performance, even though the vocal is not quite up to Luther’s take. These aside, Maysa injects power and elegance for one of Natalie Cole’s signature pieces, “Inseparable,” (see video above) with a sweet saxophone solo. Contemporary jazz radio should absolute consider adding this to their playlists. 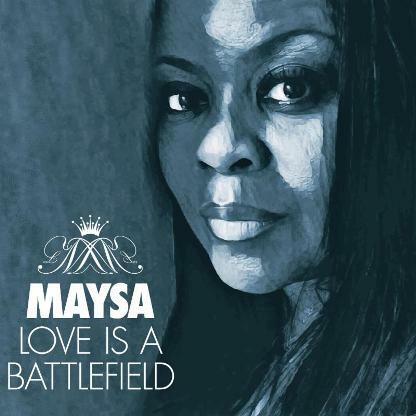 Collectively, Love Is A Battlefield is just as satisfying as her whole catalog given the minor blips, simply because Maysa’s vocal talent and savvy is more than enough to carry the music through – covers or otherwise. Four and a half out of five stars.